What is the Agriya’s surprise Christmas gift and how to avail this gift? Every festival time, Agriya wishes all the upcoming and promising entrepreneurs to attain a great business success ahead with an exceptional business offer. This time, as well, we put forward our wholehearted best Christmas and 2016 New Year wishes with a scintillating and cool offer. We express our good wishes on celebrating the season of Christmas and New Year energetically. 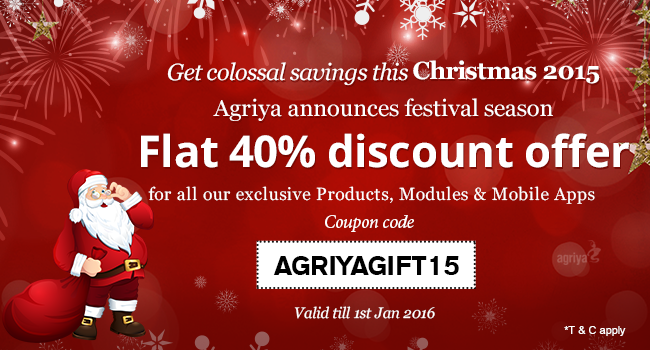 Our Christmas gift to all the entrepreneurs is a remarkable Flat 40% discount offer for all Agriya products, modules and outstanding mobile apps. It is the best time to acknowledge the entrepreneurial skills by launching an interesting online business at an affordable cost. We open this special offer door from Dec 18th, 2015 to Jan 1st, 2016. Anytime, the entrepreneurs can avail this offer by using the coupon code mentioned in the following procedure. Enter the coupon code: AGRIYAGIFT15 to redeem the exclusive Christmas offer immediately. Gain flat 40% discount on every purchase of product, modules and mobile app. Make use of this wonderful opportunity and simple procedure to start up your own online business from Agriya store. You can also gain lots of distinctive benefits along with every purchase.